Before taking a leave of absence from the Tour for alcohol and suspected drug abuse, the biggest criticism of Dustin Johnson was his inability to close out a major. It first started when he entered the final round of the 2010 U.S. Open at Pebble Beach with a three-stoke lead, only to quickly come back to the field after the first four holes, on which he finished six strokes over par en route to an 82. Months later, he needed a par on the 18th at Whistling Straits to take home the PGA Championship, but accidentally grounded his club in a hazard, dropping him into a tie for fifth place. Ever since those two golden chances, Johnson – despite his strong golf game – has never been able to claim a Major. Now, Dustin Johnson sits tied at the top of the leaderboard entering the final day at the oft-criticized Chambers Bay. With those two incidents still looming large in DJ’s rearview mirror, many wonder if he has the “mental fortitude” to pull out a win on such a big stage. But is Dustin Johnson truly deserving of the “choker” moniker? To examine this question, I looked at all twenty of the major championships that Dustin Johnson has made the cut since his PGA Tour debut in 2007. I then calculated his average score (relative to par, not stroke count) in the first three rounds of these tournaments, and did the same for the fourth round of these Majors. It turns out that Dustin shot a combined four-under par in his first three rounds of these 20 Majors, but tended to come out weaker on Sunday, shooting a combined 30-over par. I then ran a two-sample T-test to see if there was a difference in how Dustin Johnson performed on Sunday vs. Thursday through Saturday. The corresponding P-value was .027, which suggests there’s evidence that DJ might tighten up in his last 18 holes. But this method doesn’t take into account his performance relative to the respective course he played on. It could be that he just had a few bad rounds that throw off the entire analysis. To ensure that my conclusion was sound, I took the average of his first three rounds in each tournament and paired it with his respective final round performance. The table below displays these pairs, with the instances where there is greater than a two-stroke difference highlighted in green. 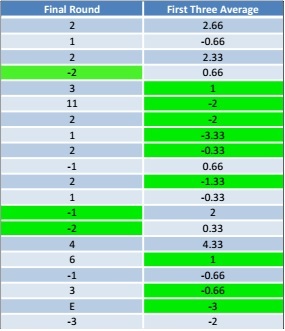 I then ran a paired T-test to see if he fell short on Sundays compared to his first three days of each tournament. The respective P-value for that test was .029, again enough to suggest that DJ may let the moment get to him on these last days. Dustin Johnson has a great chance to finally claim his first major later today, but if history has anything to say about the outcome, he might just leave the Pacific Northwest empty-handed yet again.